The following is taken directly from Leonard Zahringer's page at http://www.geocities.com/Heartland/Acres/2337/history.html. The photos of the castles, were sent to me by Marc Nafzger of switzerland. The name ZAHRINGER may be a combination of Zah [tse] German for "tough" and ringEN "wrestle" or ringER "wrestler". From the book A Dictionary of Surnames by Partick Hanks & Flavia Hodges, we get the following definition, "ZAHRINGEN German: habitation name from a place so called near Freiburg in Breisgau. The title Duke of Zahringen was first assumed in 1100 by Berchtold, a descendant of Berchtold I Count in Breisgau 962-8. From them descends the former Grand Ducal house of Baden." From the Zahringer Winery near Freiburg comes the following history. The name of Zähringer originates from a castle named Zähringer castle (on the Zähringer castle hill) near Freiburg in Breisgau (Baden). It was the first residence of a dynasty of 6 dukes of Zähringen, who ruled over wide parts of the region of Freiburg (Baden) to Geneve in the north of Switzerland. 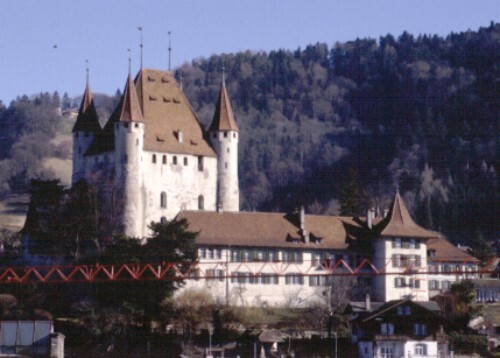 They built several castles and fonded several towns in South Germany (Freiburg i. Breisgau, Villingen, Neuenburg) and in Switzerland (Fribourg i. Ü., Bern, Thun, Rheinfelden, Murten). The generation of the dukes of Zähringen died out 1218 with Bertold V. In the rooms of the vineyard Zähringer in Heitersheim there is an exhibition of the histroy of the dukes of Zähringen. Originated from one of the colleteral lines of this dukes lived 3 families in South Germany after 1218 (Neuenburg, Freiburg, Offenburg). Today there are about 500 families in Germany named Zähringer. Most of them live in Südbaden. There are 3 books in german language about the dukes of Zähringen (in 11th until 13th century). They are avaiable from the printer for 120 DM.